Have a rainbow whenever and wherever you want it. No waiting for it to rain and the sun to shine. The rainbow in my room is motion activated and the LED lighting makes the rainbow nice and bright. Also motion activated. With a wave of your hand you can turn the rainbow on and off. Projects on the wall or ceiling. 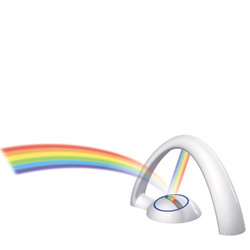 This device also adjusts to change the rainbows shape. Optional on/off timer. 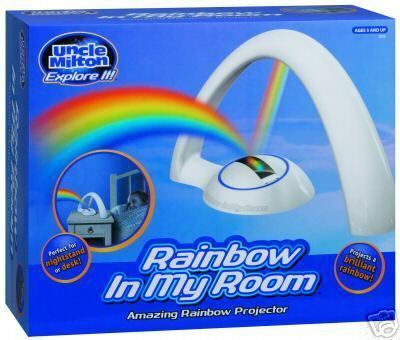 With its automatic shut-off feature, the Rainbow Projector makes the perfect night light. No worries about running out of battery since the projector has a jack for optional AC adaptor. Requires 4 AAA batteries, not included. 10" x 4.5" x 6". Ages 5+. Limited quanities available, get them while they're in stock!